Prepared in 55 minutes or less. Peel, seed and cut pumpkin into 1½-inch chunks. Crush in a mortar and pestle the marjoram, garlic, kosher salt, coriander, cinnamon and cumin. Add 2 tablespoons olive oil and mix to form a paste. In a large bowl, toss pumpkin in spice paste. On the parchment-lined, rimmed baking sheet, spread pumpkin in a single layer. Top with another piece of parchment and cover pan tightly with foil; bake until tender, about 25-30 minutes. Remove top parchment paper and bake until pumpkin lightly browns, approximately 30 minutes; cool slightly. 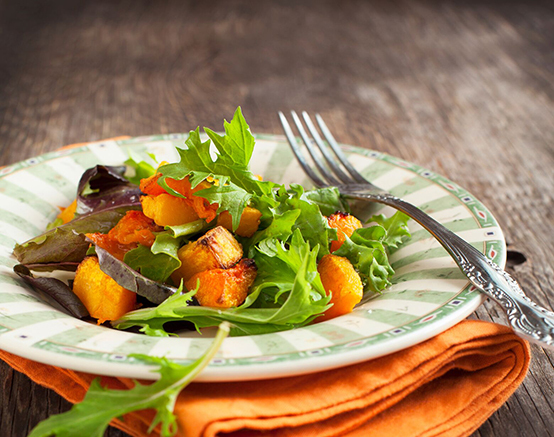 Return pumpkin to bowl and drizzle with 1 tablespoon olive oil and 2 tablespoons fresh squeezed lemon juice. Add roasted chopped pecans, dried cranberries, sea salt and ground cayenne. Toss gently to combine. Reserve ⅓ of roasted pumpkin and place in center of a large serving platter. Add fresh baby arugula, the remaining olive oil, lemon juice and sea salt to mixing bowl with pumpkin. Season to taste. Toss gently. Pour the arugula pumpkin salad atop serving platter. Arrange cheese pieces on top of salad. Drizzle with aged balsamic vinegar and olive oil to taste.